We've passed the halfway point people! This is recipe 6/10 for my 10 Recipes 10 Weeks series. 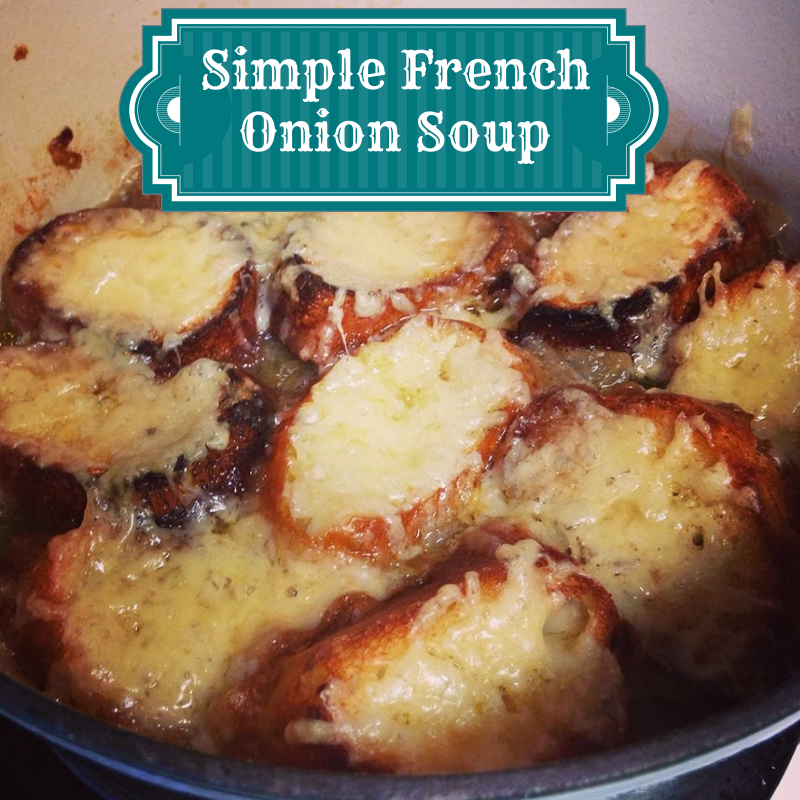 I've always been a fan of French onion soup, but it wasn't until I had it in Paris while studying abroad that I fell in love with it. I went to Paris at the tail end of my trip and by that time had gotten a terrible sinus infection. I was in desperate need of antibiotics. I ordered soup a l'oignon and though it didn't cure me, it definitely made me feel much better. I used this William Sonoma recipe as a reference, but I made it even simpler. I made this for lunch on a rainy day and shared it with some of my friends. Serves 2-3 people. 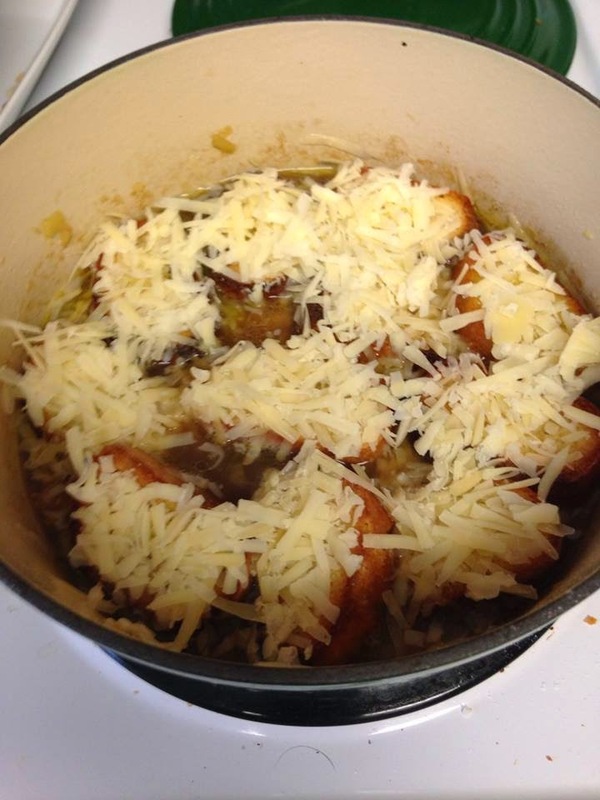 For the recipe you can serve in ovenproof individuals bowls or use a dutch oven like I did. Heat the dutch oven over medium heat. Add in the olive oil and melt the butter. Add in the chopped onions and cook until golden, 4-5 minutes. After they've turned golden, reduce the heat to medium low and cover, cooking for about 15 minutes. Stir occasionally. After that, uncover and add the sugar and salt. Stir occasionally until they are caramelized, about 25 minutes. Add the flour and stir another 2-3 minutes. 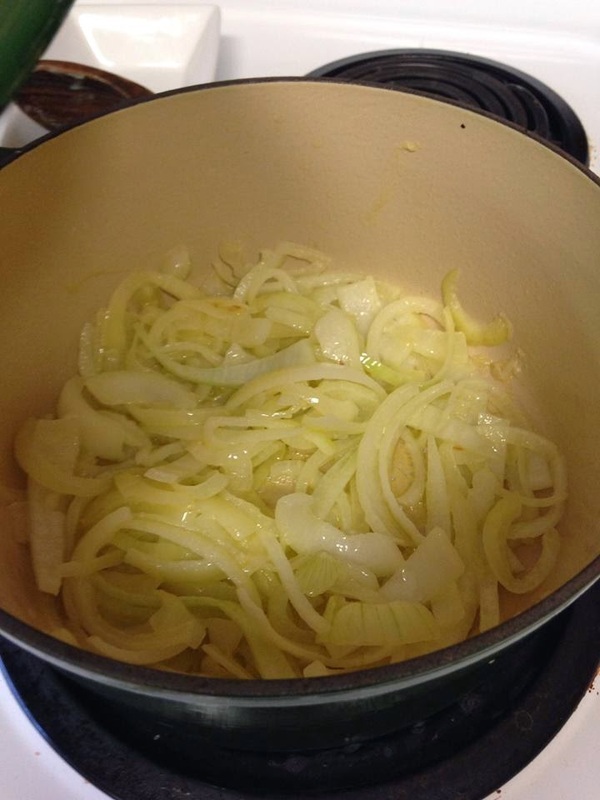 If you are using the dry white wine, heat the stock and white wine seperately over high heat while caramelizing the onions. If not, simple add the beef stock after the onions are carmelized. Add the pepper and turn the heat to medium. Cover partially and cook until the onions begin to breakdown, about 45 minutes. Meanwhile, preheat a boiler. Put the bread slices on a baking sheet and drizzle with olive oil. Toast them until golden brown, flipping to make sure you get each side. Once out of the oven, rub the toasts with the garlic. Afterwards, reduce the oven temperature to 400 degrees. At this point you either ladle the soup into indivdual bowls or leave it in the dutch oven. 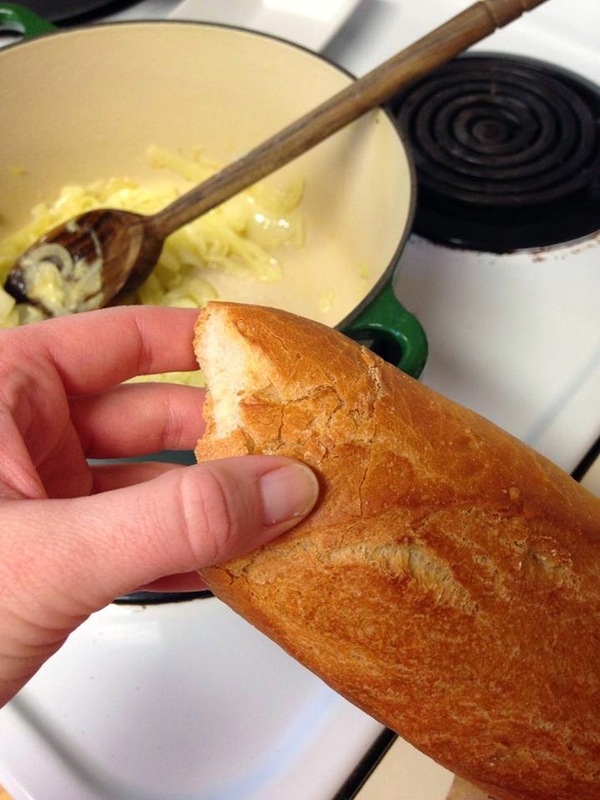 Whichever you choose to do, place bread on top of the soup and then sprinkle with the cheese. Place in the oven until the cheese turns golden and melty, about 15 minutes. Serve. While carmelzing, feel free to snack on the delicious french bread you just bought. 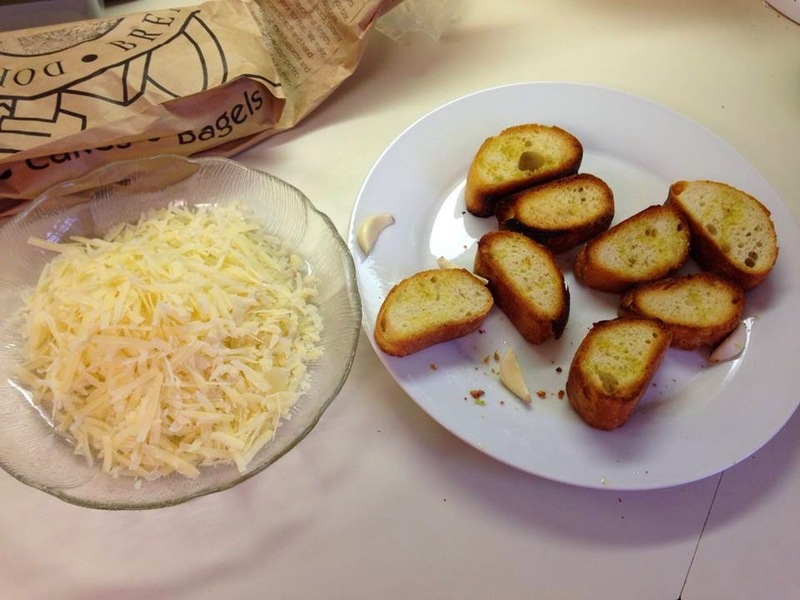 Get the cheese and garlic toasts ready. 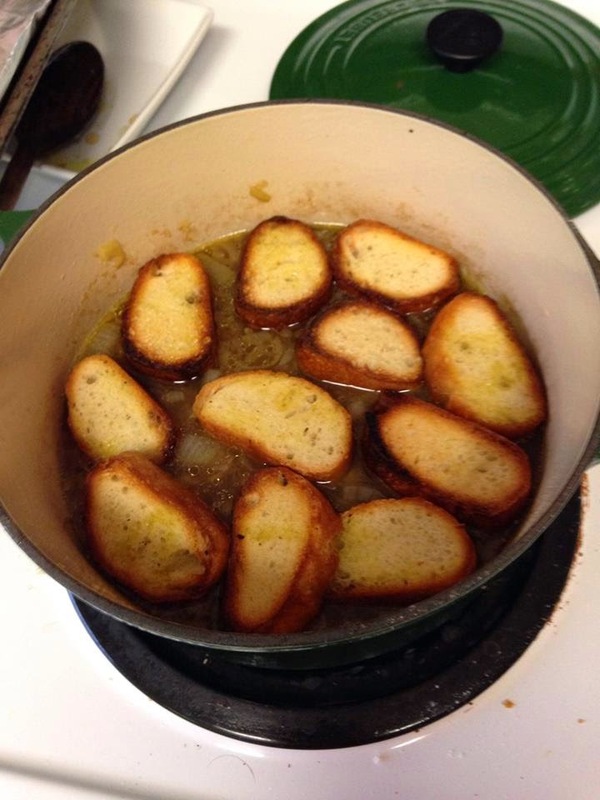 Add garlic toasts to soup. Add cheese, bake, and then serve! *If you know me well, I would normally be adding wine. Somehow I forgot to pick up a bottle before making this.